In June 2012 my friend Maria Niada and I spent time in Pantelleria, an island off Sicily and about 83 km from the coast of Cap Bon in Tunisia. 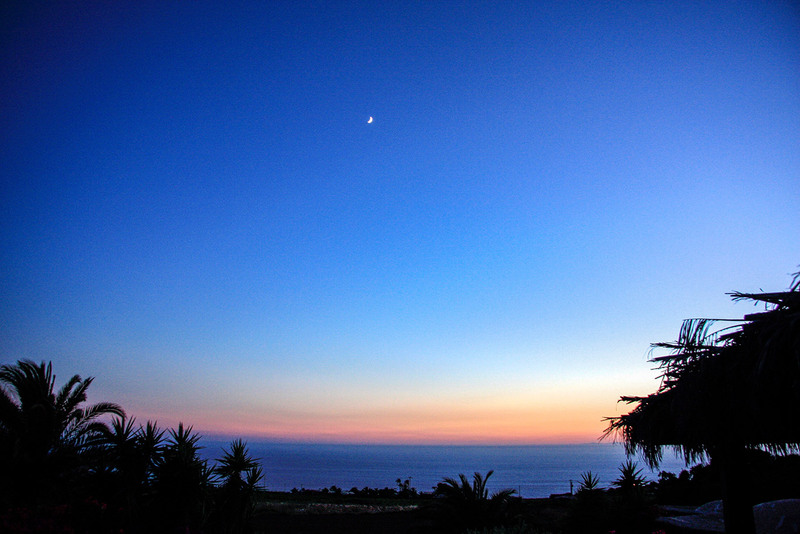 With a rugged shore and not within easy access, Pantelleria has a natural wild beauty. Our host invited us to stay with her in a restored dammuso, the island’s cubic shaped house with arched ceiling and volcanic stonewalls. 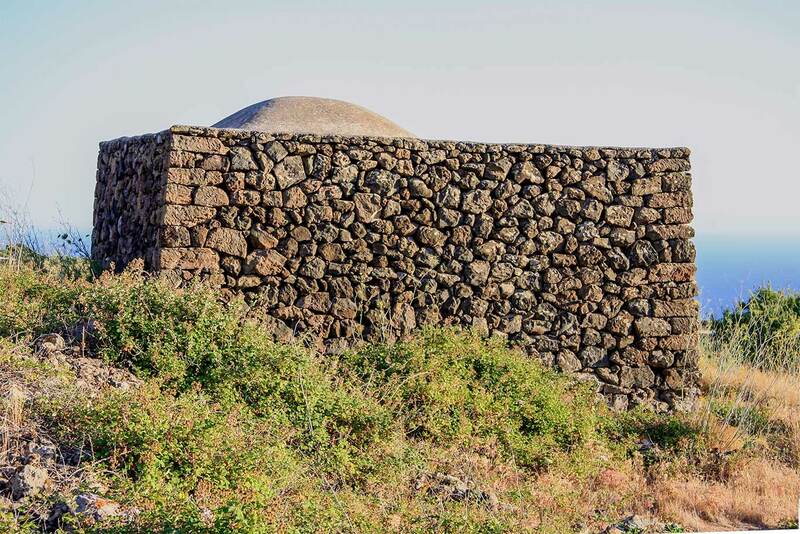 Considered as the architectural symbol of the island, the dammusi are built with local stone and blend perfectly in the surrounding landscape. Their stucco domed roof was conceived to channel and collect rain water into an underground cistern situated in close proximity. The double-layered walls, sometimes one meter thick, insured a comfortable temperature in all seasons keeping the rooms cool in summer and warm in winter. Home often consisted of a series of adjoining dammusi with niches carved in thick walls which nowadays serve as closets or as bedrooms. The island’s natural beauty prevailed behind walls of dark volcanic rock where the landscape unfurled over the hills. In the distance the turquoise blue waters of the Venere Lake shimmered. Lago di Venere with its sulphuric springs and soda-rich mud is a geological occurrence inside the crater of an extinct volcano. 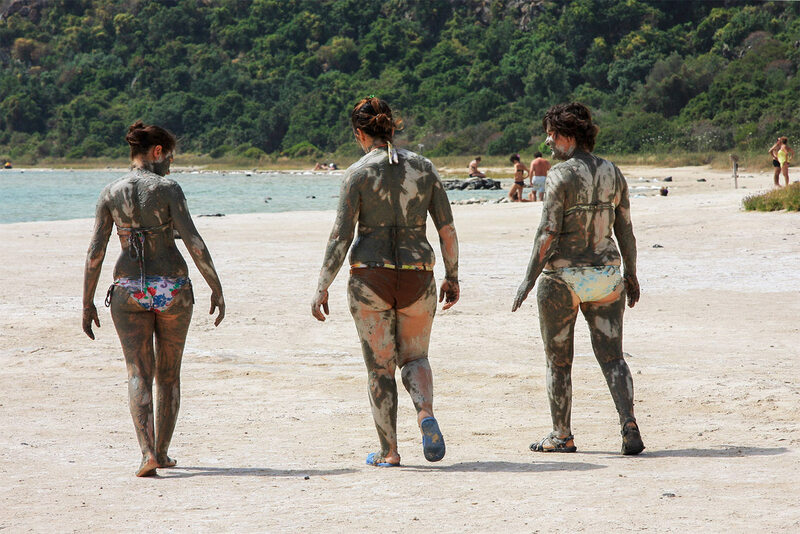 Locals and holidaymakers splash in its mineral waters and smear their bodies with its clay to heal and detox the skin. The sea is a constant presence on the island, and its waters a recurrent reminder of it volcanic past. As we set off from the port of Scauri to sail around the island, we stopped to swim towards a grotto with thermal springs. The water in some places was too hot but there were naturals pools with warm water where we sat and were lulled by gentle lapping of the waves. It was pure bliss. 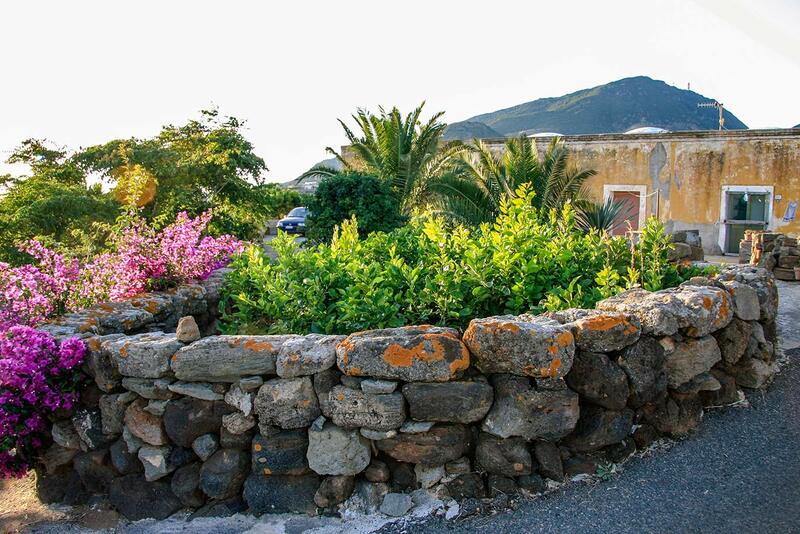 Pantelleria is a crossroad of history and cultures, Phoenician, Roman, Byzantine and Arab. All contributed to its architecture, its agriculture and its language. The Pantescans became Christians around the 12th century but have retained in their dialect many words of Arab origins such as zibbibo a type of Muscat grape used to make passito – sweet wine. Imported first by the Phoenicians, this particular grape – Muscat of Alexandria – still grows in Pantelleria and is as ancient as the myth of the goddess Tanit who seduced Apollo with its nectar. The vinification process of passito wines, is known as appassimento whereby the grapes are partially dried on straw mats for three to six months; they are then pressed and left to ferment resulting in a rich sweet wine. The actress Carole Bouquet who lives on the island grows zibbibo grapes and produces her own passito, the Sangue D’Oro, She invited us to try it and we became seduced by its fruit notes. The island is known for winds blowing constantly sometimes as a breeze and sometimes strong enough to help boats sail away. 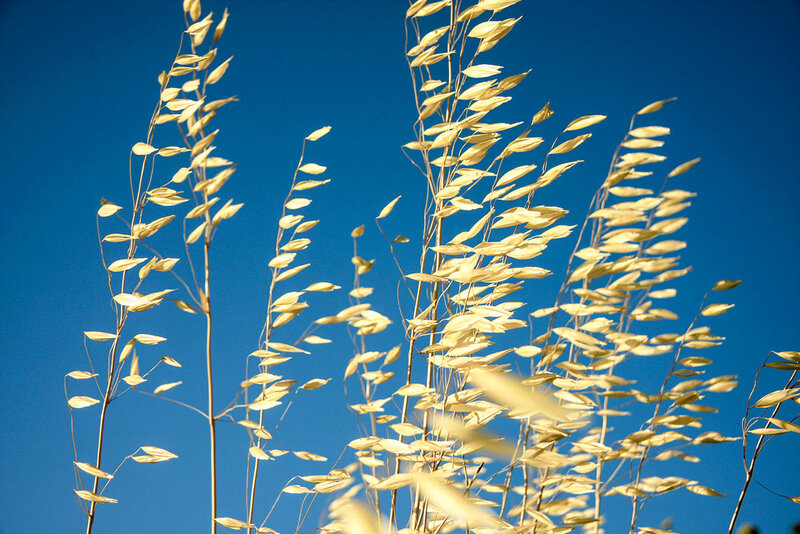 Indeed the name Pantelleria derives from the Arabic Bint al Reyah meaning “daughter of the wind”. To withstand the constant ravage of the wind, olive trees are grown in a squat position, their branches deliberately weighed down and kept close to the ground. For this same reason the giardino pantesco a four meter high and round stonewall was conceived to shelter one lone citrus tree. Like a secret garden it is accessed by a door so low that is forces the visitor to bend and bow. Pantelleria is also renowned for its capers which have an intensely aromatic flavour that earned them an IGP (Protected Geographical Indication). Caper bushes grow on every rock, in every crevice and sometimes choose to disrupt the perfect alignment of the vines. 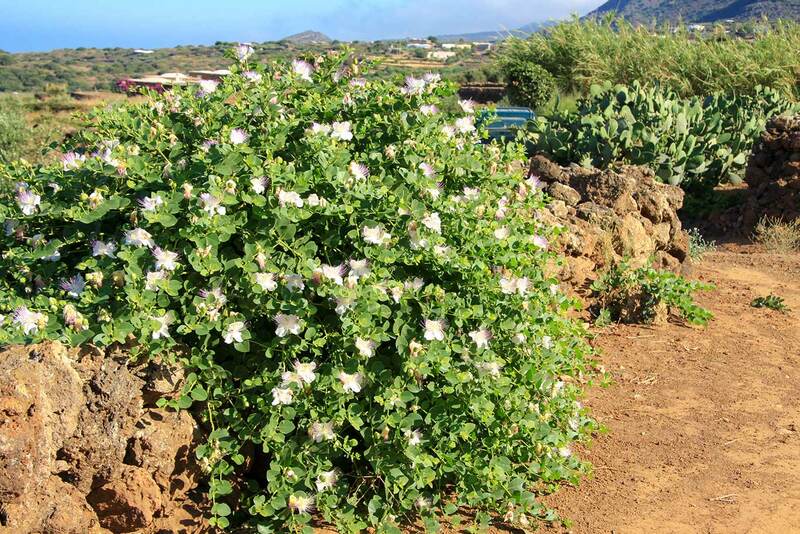 From June to July, seasonal workers flock to the island to harvest the buds and sort them by size; the smallest, known as nonpareil, are the most desirable. If the bud is left on the branch, it blossoms into a flower, which in turn is fertilised to make a berry. The berry is pickled and eaten like an olive. The buds are brined or packed in salt. 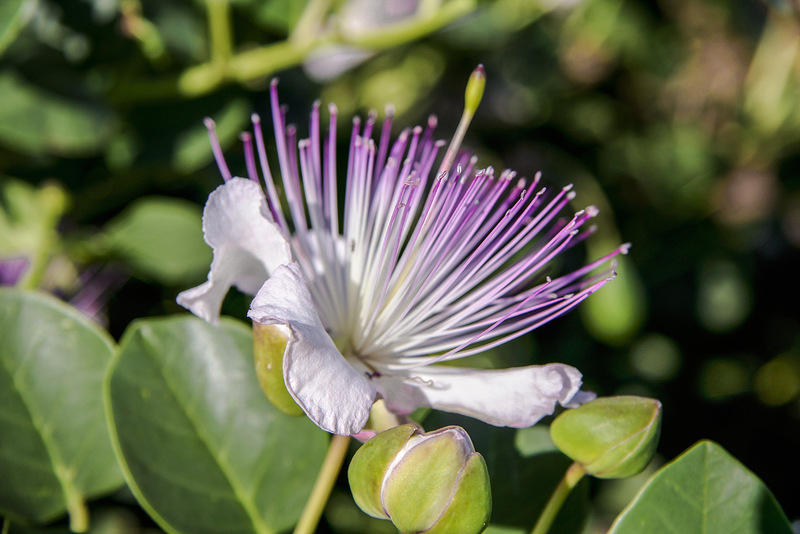 Capers have been in the Mediterranean kitchen since ancient times even their peppery coin-shaped leaves are used either fresh or pickled and added to salads. Capers give tanginess to caponata, combine beautifully with sauces and make qobbar – a meat and caper stew from Aleppo – a distinctive dish. 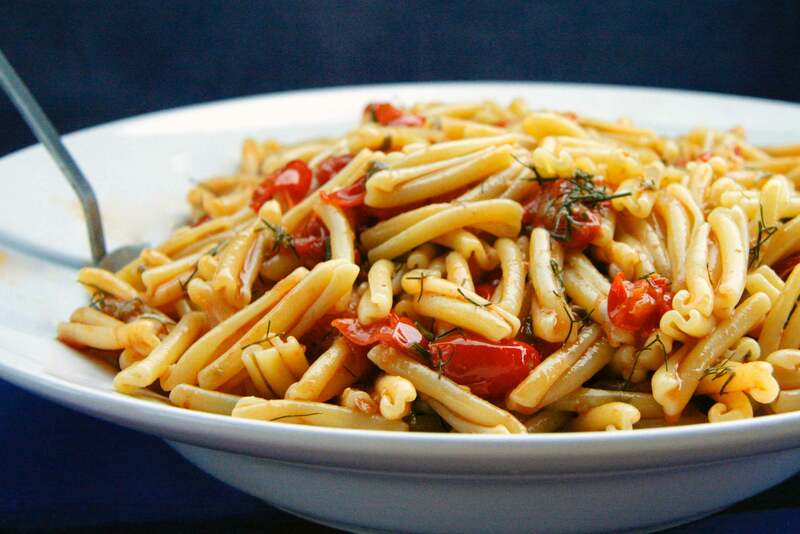 Pantescan food is simple and locally grown, tomatoes, aubergines, capers, oregano and olive oil form the basis of many pasta dishes, namely pesto panstesco. 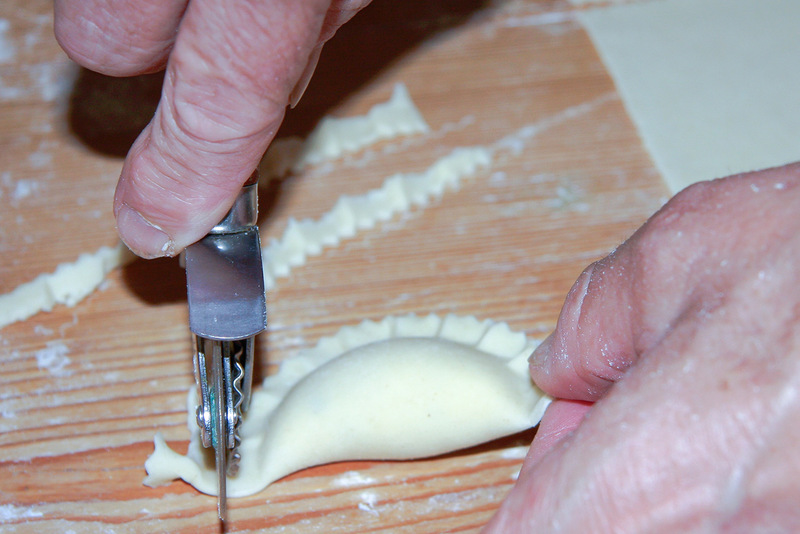 In our quest for local food, we met Grazia who invited into her modern kitchen built inside a dammuso; she made ravioli panteschi (ravioli filled with ricotta and mint). She kneaded and rolled her dough on a weathered 50 year old pine board which had belonged to her mother in law before her. She worked fast and before we could blink she had turned 2 kilos of dough into dozens of moon shaped ravioli. Back on the boat Gigi the skipper cooked lunch: pasta with a tomato, caper and anchovy sauce. He also offered two local cheeses; ricotta and tuma. I couldn’t help but think about whey cheeses from Lebanon like arishe and jebne khadra and how food travels across time and borders. We knew we couldn’t leave Pantelleria without Pantescan Kisses or bacci the flower shaped fritters which are traditionally prepared for the feast day of San Giuseppe. We returned to Grazia who whipped up a light batter. 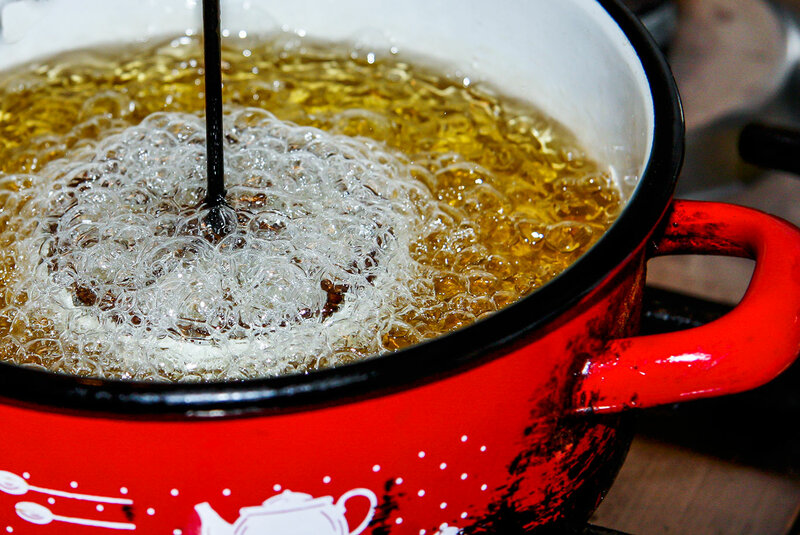 She dipped a metal implement the shape of a daisy into the batter and immediately plunged it into hot oil. The batter browned and became crisp. 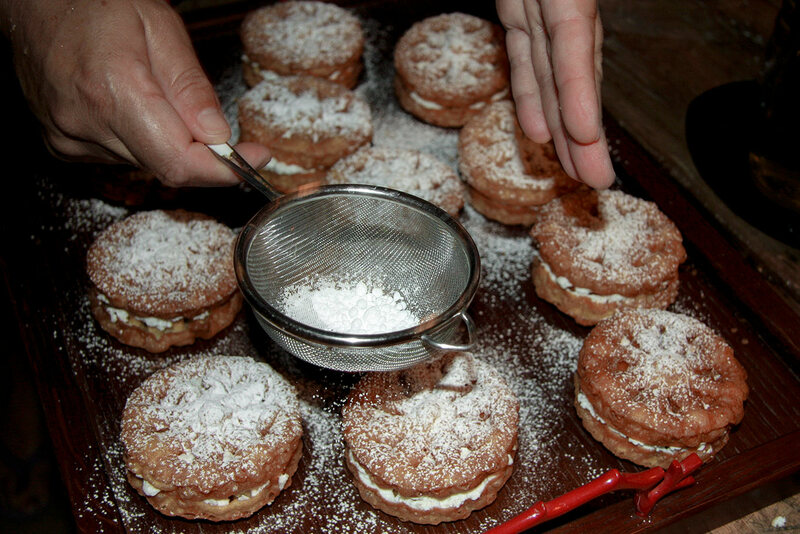 She repeated her gestures until she had several rosettes ready to be filled with ricotta and grated chocolate before she dusted them with icing sugar. On our last night, we invited the neighbours to a Mediterranean feast. We cooked Ravioli panteschi of course, together with flavours from the Eastern Mediterranean: roast chicken with pomegranate molasses, kibbeh and pistachio rolls, fattoush salad and aubergine fate. This was a menu which brought cultures together and which in some way mirrored the island’s diverse historical past. As the evening progressed, we sat chatting, sipping cool drinks and revelling in the magic of the Pantescan night.